Maxboost Universal Armband for Larger Phone - Original+ Series - Fit phone up to 6.75" and recommend for phone screen diagonal up to 5.8"
Accommodates Most Cases: We've designed the Maxboost Original+ Armband to be large enough to work with most phones and protective cases for two-layers of protection. - Its protective cases such as OtterBox, Lifeproof, Speck, and Maxboost and others. 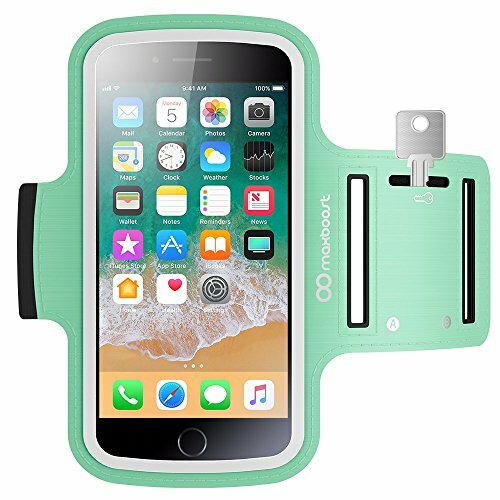 [Accommodates Most Large Phone up to 6.75-inch diagonally and recommended phone screen Size up to 5.5-inch] Maxboost Armband is made to fit larger phones including iPhone 8 plus, iPhone 7/6/6s Plus, Galaxy S9 plus, s8 plus, s7 edge, s6 edge, Note 5, LG G6 and their protective slim case. Common case brands that are compatible include Otterbox and Lifeproof. Please read the description to see complete compatibility. PREMIUM MATERIALS & Universal Sizing: Made of stretch resistant neoprene. The Maxboost Original+ Armband case for large smartphone easily bends, flexes, twists, and folds without warping. Multi-slot Adjustable Velcro iPhone Armband Will Fit Almost Any Arm Size Up To 14". If you have any questions about this product by Maxboost, contact us by completing and submitting the form below. If you are looking for a specif part number, please include it with your message.